Jon Lewis maintained he was an amateur photographer and perhaps he was, but with all due respect for the craft and talent of dozens of free lance and assignment photographers who came to Delano to shoot Cesar Chavez and his farmworker movement, for my money, Jon Lewis was the most artistically gifted photographer to ever set foot in the farmworker movement. His work not only documented this historic movement but portrayed the spirit, the sacrifice, the commitment and even more important, the dignity of the striking farmworkers. Jon Lewis was a loner. A couple of former San Jose State photography classmates served as friends, he lived alone in a studio apartment on Valencia Street in the Mission District, jam- packed to overflowing with records, art books, art work, travel knick-knacks – Stonehenge, Pyramids, Greek Antiquities, Mexican islands, and other ports of call. He did not sleep in a bed, he preferred a hammock, and besides, a bed took up valuable space. Time passed, life passed, and soon enough Jon was retired on a fixed-income and in poor health. Despite his modest life-style and low overhead, he became increasingly stressed about his dwindling finances and his inability to sustain himself in old age. Enter the Farmworker Movement Documentation Project in 2004 with its internet publishing platform. Jon’s 1966 farmworker movement portfolio sitting idle on his closet shelf for four decades gave him a new lease on life, one with purpose and meaning, he became an artist possessed. But more important than the money, Jon’s work was being exhibited globally, interested people were commenting and take note of it, and Jon’s constant worry that one day after he keeled over, his art would be tossed into a San Francisco dumpster seemed less likely. In the Fall of 2009, just a few months before Jon collapsed in the hallway of his apartment building and died, Yale University had made the first contract payment to acquire Jon’s entire portfolio, which after being curated, would be available to scholars and the interested public in 2011 . . . and for centuries thereafter. Within days, Jon’s earthly possessions were scattered – most given away to strangers in lieu of packing and storage fees, some discarded and left for trash, the rest, especially recently purchased computer hardware, taken by distant family. The only pieces of Jon’s work to survive intact were his farmworker movement portfolio then under contract with Yale University, and the original of Jon’s most precious and prized photograph, which he had lent to a friend for safekeeping. 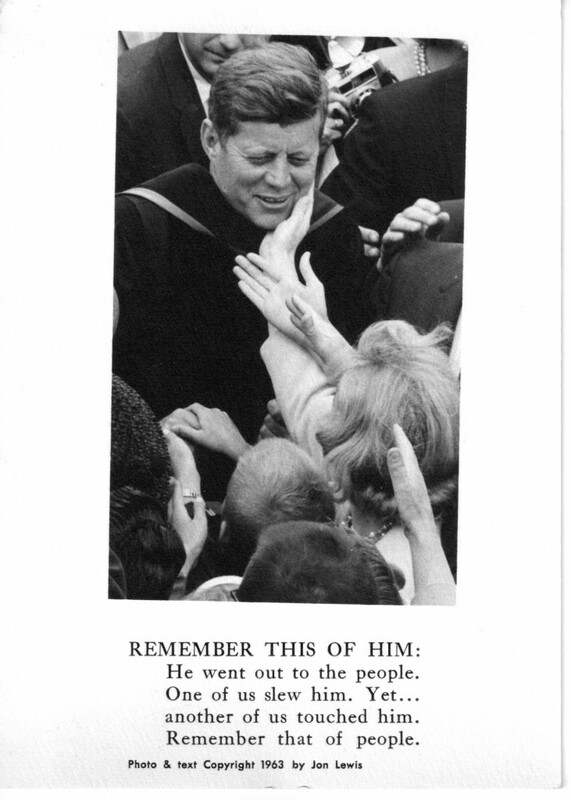 It is this photograph of John F. Kennedy combined with Jon’s remarkable caption, I share with you in this remembrance piece. True, the presentation is slightly askew but because it is Jon’s own presentation, I choose not to disturb it. I am most fortunate to have known and worked with Jon Lewis. Life is strange, but only because of the people who live it.